Launching a Magento 2 store is by no means easy – it isn’t just a website, it’s a complex online business, where all business processes should be well thought out before going digital. If you’re one of the lucky ones with experience moving a site to another platform, you’d agree. If not, this article will help you to consider all the significant elements that make up successful e-commerce. Explore basic financial, security, and legal matters which are necessary for opening an online store in your country. Contact a development company after the concept of the project is done. Nobody knows the goals of your business better than you, that’s why you should provide a vector for the development process at the very beginning. After you’ve settled with a contractor, ask the project manager to describe the workflow to you in detail. Try to delve into every stage of the process as deeply as possible. For instance, it could be lack of organic childcare products on the market. If you want to enter this market, you can offer products with detailed description of their ingredients, effect on children’s health, manufacturing fabrics etc. People who are interested in such products will consider your service as a solution for their problem. They will buy it. Then, define what kind of people are facing the problem you want to solve. Determine their characteristics: gender, age, marital status, education, ethnicity, income, etc. Don’t forget such characteristic as lifestyle. It consists of three main parts: activities, interests, and opinions. Explore what your customers like to do, what they are fond of, and what they think. These will help you to understand how to speak to your customers; will the tone of your message be formal and business-like, or more casual? Keep the concept of your target audience in mind at every stage of website planning – from choosing the domain name and designing a logo, to your overall content strategy. Choose the domain name which will describe your business; it should be short and memorable. It’s better to secure it as soon as possible, before someone else swoops in and takes it. Also, decide the domain in which you’d like to register your website. There are international domains (.com, .net, .org), domains which refer to a specific country (.fr, .us .uk), and even domains which describe activities (.photography, .shop, .guru). Note that a domain name is one of Google’s top ranking factors. Only unique names get an SEO advantage, so it’s better to avoid names which sound like existing ones, because the original domain will rank higher anyway. Don’t forget to buy an SSL certificate together with the domain name – domain registrars and/or hosting providers usually have attractive offers for such a deal. Why is it so crucial? As buyers enter their credit card information at checkout on your online store, there is a possibility that precious data could be stolen by malefactors. That’s why it is crucial to have a security protocol which will encrypt all your customers’ data. A Secure Sockets Layer (SSL) is a standard form of security for e-commerce. Secure sites are easy to recognize as their address starts with HTTPS instead of HTTP; the last letter means ‘secure’. Browsers react to it and let users know whether the site is secure. SSL is usually sold for a recurring fee. The most expensive packages include turning a browser bar green in order to show the highest level of protection. Today’s internet users trust browsers’ warnings. It is highly likely that they will not buy anything from an online store which doesn’t use encryption. 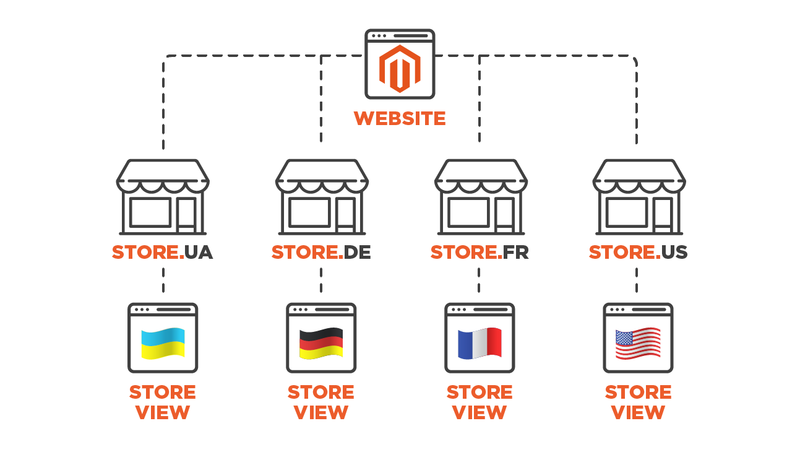 Magento 2 gives you the opportunity to manage several websites/stores/store views under one installation, all of which will be available from the same administration panel. These websites and store views can share design and settings, or be completely different. If you want to create several language versions of your website, there are two ways you can do it. First, you can make a separate domain for each language version. Second, you can keep a single domain but create different store views. 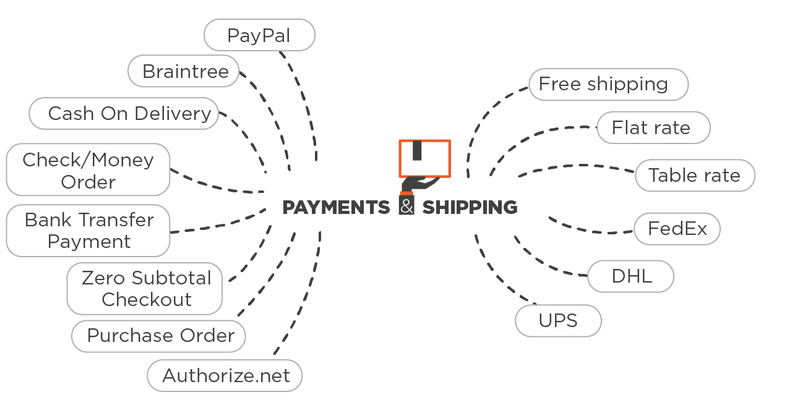 Each e-commerce website structure could be visualized as a hierarchic tree. Your site menu is a navigation map which customers use to find what they want to buy. It should be simple and understandable. Nobody wants to waste time trying to find out where goods or services are hidden on your website. Think carefully about how your catalogue has to look – it’s very convenient to plan it using mindmaps. Define which categories are a priority for you and place them as close as possible to the homepage. Group goods/services by types and make sure that every single product page goes no deeper than the third level in the menu. Firstly because Magento developers need to get this information to develop the website and second because it will influence user experience and therefore conversion rate and SEO – as Googlebots love well-organized catalogue structures. How do you go about creating your Magento website’s design? First of all, think of the main message your brand conducts. What is your value for customers? What is your vibe? Think of the emotions you want your brand to be associated with and you will come closer to your specific style. For instance, modern, hi-tech, minimalism, casual, pop art, etc. If you’re stuck with creating the visual style of your website we recommend you to have a quick look at your online competitors. Taking into account that they struggle for the same target audience, you can get the feel of colors, fonts and themes they use – and think how to outsmart them. Now that you’ve defined the message and chosen style, come up with the elements which would appeal to your target audience – a free delivery, or a monthly subscription to your product, a Refer a Friend Program, or a filter of any color of the spectrum of your goods etc. – that will be the flesh and skin of your website. You already have the site skeleton, remember? That catalog structure of all categories and subcategories. After you’ve got the feeling of how your site should look and what features it should have – it’s time to start looking for its tangible embodiment. Magento web designers offer dozens of ready made design themes for any taste and budget, but each of them has its own technical peculiarities. We recommend spending some time surfing through ready made design sites to find some examples of the Magento design theme that may suit your site most. If you still can’t find one, at least it will help you to crystallize your vision and describe it to a web designer who can help you create a custom design. Themes cost anywhere from $30 to $500 and you may find your one and only theme there, but there are some pitfalls we want to tell you about. 1) Ready themes often have bugs that can negatively influence your online store in unexpected ways, spoil user experience, delay money operations, etc. 2) Those who make themes for marketplaces frequently forget about SEO. For example, they can forget to include microdata in a code. Microdata allow search machines to identify product pages and show relevant information like rating, cost, a number of testimonials, etc. Microdata make the page noticeable and attractive among competitors in search results. If there isn’t microdata on a page, you will not have a favourable position in search results. 3) Ready themes may be slow. They are often full of beautiful features which make pages heavy. At best, producers test performance on a website with 10 product pages. In the worst cases, they don’t pay attention to the performance at all. But if loading takes more than 3 seconds, customers are likely to leave that website. Not to fret, these aforementioned pitfalls can be avoided in two ways. First, ask a theme author to fix bugs, accelerate pages and add SEO features to the theme you’ve purchased. The second option is to simply customize the default theme on your own. Luma and default Magento 2 theme support microdata and both perform well. In this case, you have to find design examples you like and show them to your developer team. They will add required features and you’ll end up with the website of your dreams. Both of these approaches have roughly the same overall cost. Custom design does not only make your brand stand out amongst your competitors, it actually makes your brand identity recognizable, which is very important in a modern digital world. It’s not enough just to attract the attention of your customers once, you need to make them like your brand, remember it, and return to your Magento 2 store repeatedly. – custom design means secure design. No worrying about rigid templates full of bugs and security breaches. – lightspeed performance. As we mentioned above, ready made design themes can be poorly tested and perform slowly as a result. This issue can easily be avoided with a custom design. In accordance with Criteo, 67% of all e-commerce purchases were carried out via mobile devices in North America in 2017; in Europe this number hovered around 50%. At the same time, transactions on desktops are dramatically falling. That’s why you should pay attention to the mobile-friendliness of your website. 1) Responsive design. In this case, your website will be developed so that it adapts to any screen size. The website will view well on desktops, tablets and mobile devices. 2) Progressive Web Applications (PWA) is a technology which allows building websites which look and perform like apps. After a user visits your website he will be suggested to install the site as an application in order to have a quick access. But unlike an app, PWA doesn’t consume device resources, because essentially it’s just a quick link to the website. It even partially works offline, and normally in places with poor internet connection. When testing website performance at the development stage, pay attention to page loading times on mobile devices; currently Google’s paramount ranking factor. If your website loads in several seconds, perhaps it’s time to implement the Accelerated Mobile Pages (AMP) technology. AMP allows you to significantly reduce page loading time with the help of modern technology. According to Google, AMP pages use nearly 1/10 of the data that slower pages use, and can fully load within one second. AMP pages are easily spotted by the lighning symbol and almost always appear as a top search result. If you are interested to know more, you can learn more about AMP and PWA in our article ‘How to create Accelerated Mobile Pages in Magento 2‘. There is no single internet browser which is used by everybody. People use many different browsers to access the web depending on the country, language, etc. In an ideal world, you should make your store compatible with all of them. But in real life it’s quite enough to define the preferred browsers of your target audience.. If you already have an online store and use Google Analytics (the service that provides statistics on browser usage) you can easily see which browsers are most popular among your visitors. If not – here are some other tips. If your target audience is of an older generation it’s highly likely that most of them use an old version of Internet Explorer. They often have outdated computers, and they are cool with using the standard software. If your target audience is young people you should make your store compatible with the latest versions of Google Chrome (for those who use Android) and Safari (for MacOS users). Take into consideration that different countries have different statistics of browsers usage. In accordance with Statcounter, 49% of internet users in the USA use Chrome, 32% use Safari, and 5% use Firefox. 50% of Chinese use Chrome, 33% use UC Browser, and 7% use Opera. 57% in Europe use Chrome, 18% use Safari, and 9% use Firefox. The most popular browser in the world is Chrome used by 58% of people. Find out which browsers and their versions you want your store to be compatible with and share them with your development team. There are 6 types of products in Magento 2: simple, configurable, downloadable, virtual, bundle and grouped. You have to determine which of them you will use. Let’s take a look at them. Simple products are provided with single characteristics. Customers can’t choose their colour, size, etc. For example, you sell a certain model of a camera and users can only buy it with the ready assembly. Configurable products have different characteristics customers can choose among. For instance, you sell a dress which is provided with a variety of colours and sizes so that users can select the most suitable option. Downloadable products are used for online software such as MP3 files, e-books, Magento extensions, etc. These products don’t allow the selection of a shipping method at checkout because it’s not needed. Virtual products are ready made, preconfigured, intangible objects. Things like insurance, reservations and whatever else. They also don’t allow for the selection of a shipping method at checkout. 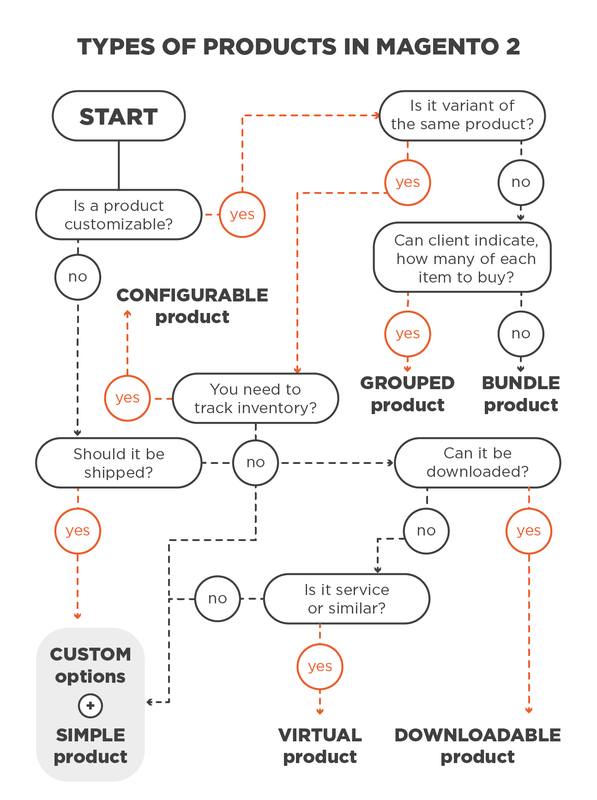 Bundle products mean that a customer can assemble a unique product choosing among different options. For example, it may be a computer, a bike, a bouquet, and anything else consisting of many elements. Each item in a bundle is an independent single product. Grouped products consist of several simple products. For instance, you can gather a video camera, a tripod, and camera lens to sell them as a bloggers’ set. Each item from a grouped product can be bought separately, but you can group them and offer to customers. If you have some requirements that don’t fit in with the above mentioned types of products, just ask your Magento web developers to work it out. Perhaps that product type already exists and can be downloaded and installed for you. 1) CSV import. CSV is a file format where product data can be stored. 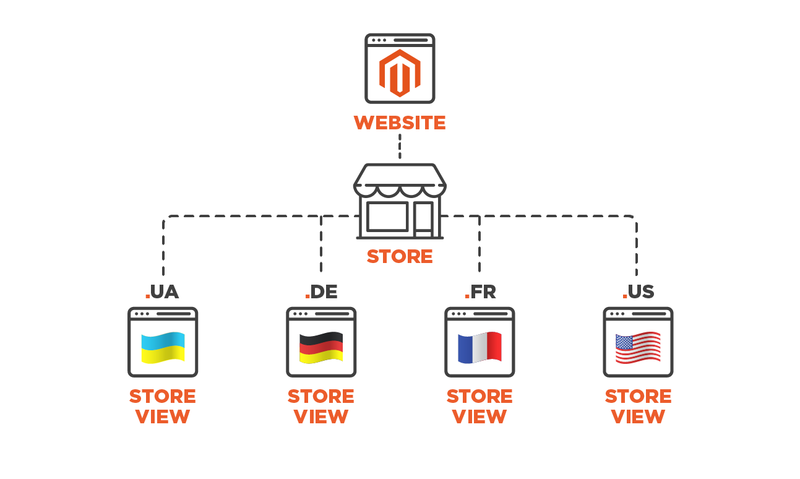 This way works perfectly if you need to move your products between the same Magento releases. 2) Data Migration. Data migration tools are used to migrate from Magento 1 to Magento 2. 3) A Ready Module. A ready module is used to move from a 3rd-party system to Magento 2. There are many ready-made solutions for the most popular e-commerce platforms. If there is no ready solution, a custom module has to be created. 4) If you already have a site on a custom platform but no ready module to import its data to Magento 2, developers will need to figure out your site’s database structure and develop a custom data import script. There are even migration tools on the internet which help to import data between a variety of platforms also based on a CSV import. However, we wouldn’t recommend using them, because they often break an input database and fixing this issue may be time-consuming. In addition, the tools are often incapable of importing complicated types of products. When the time comes, you’ll know which option works best for you. If you’re still not sure, check with your development company, they’re likely to have the experience and expertise to help you best import your product data. If you need something that isn’t included in the list, Magento can be easily integrated with any other payment provider and shipping company and there are already made extensions for the most popular ones. If you want to make Magento work with a specific provider, the feature can be developed according to your demands. A blog is a more complicated issue. E-commerce sites can do without it, but a blog is still a powerful way to attract customers. On one hand, search engines like long articles with tables and pictures. On the other, quality content makes people trust you. Consider the three options below if implementing a blog on your site is right for you. If yes it can be done in three ways. Setting up a blog extension. There are already built extensions which allow for managing blogs on Magento sites. This option provides limited functionality but usually it’s enough for online store blogging. The blog becomes a part of Magento and shares the website’s design and domain. This is an appropriate option in case you are not going to post long articles every day. We recommend two extensions we’ve worked with: Blog MX for Magento 2 developed by Mirasvit and Blog for Magento 2 made by AheadWorks. Blog MX is free and includes the most essential features like configuring SEO settings, adding featured images, and the ability to preview posts before publications. Blog for Magento 2 costs $349 and is full of additional functionality. For example, it allows for the scheduling of publications, showing posts to certain customers, and adding related blog posts to product pages. Integrating WordPress into Magento. WordPress is a platform made especially for blogging. It has a wide range of features which allow creating and editing articles. 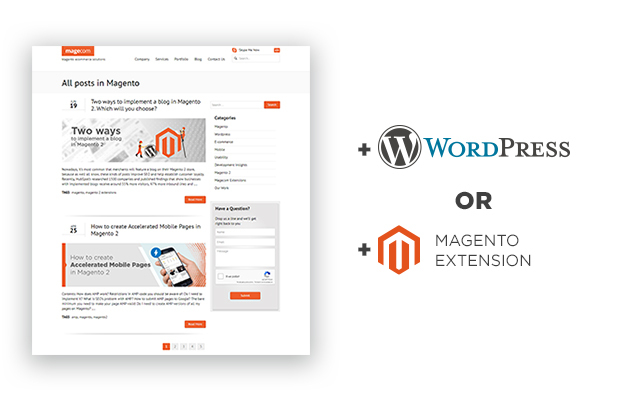 There is a free extension developed by Fishpig which integrates WordPress into Magento. But the integration has significant disadvantages. The first is that the blog doesn’t share customer accounts with the store and instead is set up as two different databases. However, this can be fixed by installing an extra extension. The second is that the search doesn’t work well by default after integration. In order to fix it, you have to buy the additional extension for $49. The third is that WordPress is often being hacked and intruders can break into integrated Magento stores via this method . That’s why you should pay special attention to the security of your blog. Making a separate WordPress blog. In this case, you have two different sites located on their own domains (for example, store.com and blog.com) and yet it’s also possible to place a blog on a subdomain (blog.store.com). Developers connect the websites with special links in the header and footer of the page. They add bright buttons which lead users from the store to the blog and vice versa. The bad thing is that when a customer reads the blog they won’t see the cart above and may forget about making a purchase. It happens because the store and the blog are different websites though they can be set to share a single database if an expensive custom module is developed.. They also have different databases so blog and store users aren’t the same. One more disadvantage is that you don’t have a common search for two websites by default but it can be fixed if you develop custom features for the blog and for the store. It can turn out to be quite expensive quite quickly and developing can take a lot of time. Moreover, this option is worst for SEO, because a blog on a separate domain doesn’t lead long tail keyword traffic to the online store, nor does it boost your store ranking. The advantages of this option are wide WordPress functionality, the possibility to have different designs, and high security. If WordPress is hacked it can’t be used to break into Magento, because they aren’t integrated into each other. Decide how often you will publish blog posts and how long they will be. If you are going to post lengthy articles frequently we recommend you to use WordPress. Magento offers huge possibilities for managing marketing companies and promoting products. Free OpenSourse edition allows adding goods to the wishlist, sending them to friends, zooming on pictures, showing “Recently Viewed” block, giving discounts, launching “Buy X, Get Y Free” promotions, sending newsletters, notifying customers if the transaction failed, and more. Paid Commerce edition provides you with more advanced options such as creating promotions by segment, having multiple site views for different customers, automatically reminding users about abandoned carts and wishlists, and sorting catalogue by the most popular items with one click. Owners of the Commerce editions have access to the Business Intelligence tool which includes 75 advanced reports, and helps to discover the most profitable group of customers and increase the store’s conversion rate. Define the functionality you will need. If it isn’t included in a default Magento theme, it can be installed via extensions or be specially developed. Currently, Magento is provided with three options. There are free Magento OpenSource and paid Commerce Starter and Commerce Pro editions. The OpenSource includes the majority of features you need to conduct e-commerce business. For instance, it allows creating various product types, sorting buyers into groups, offering discounts, and so on. The Magento Commerce Starter consists of all free features plus additional ones like wish lists, reward points and exclusive private sales. It also includes cloud-hosting by Magento and 24×7 email support. The third available edition is called Pro for its wide range of opportunities. The Magento Commerce Pro consists of all functionality of the previous packages plus B2B features, advanced analytics, multi-server setup, isolated hardware, and a personal launch manager. If you need more information about Magento editions, read our article “The Difference between Magento OpenSource and Commerce Editions“. Magento 2 has a wide range of features out of the box. You may need something that isn’t included in the platform by default. If so, check what can be installed as an extension. Merchants often buy an advanced layered navigation in order to improve the native one. This adds such features as horizontal filter bar, selected filters block and filters dashboard where they can be conveniently managed. Shop by brand is also a popular feature. It allows customers to search products by brands via adding appropriate items in a navigation block. The extension makes it possible to create special pages with information about brands and with their logos and are shown to customers while searching. Frequently merchants install advanced search. This feature shows autosuggestions when a user types a specific search query. If a query contains typos it finds results for the correct word and allows enabling “Did You Mean” corrections. Define whether you need to integrate Magento to any 3-party system, ERP, CRM, POS or PMS. It is a complicated and time-consuming process, that’s why you should let developers know about it beforehand. This way they can properly plan for the work needed and finish it in due time. Both Magento Commerce editions include cloud hosting as platform-as-a-service, which means that you have access to the software on a cloud. You can configure and scale it in any way you want. 1) The cheapest option is a shared hosting which means that your website will share the same server with a lot of other sites. In this case, the performance of your store will depend on how many resources on the server are being used. Some companies offer shared hosting optimized for Magento since Magento needs special software to run well. Choose this option if you aren’t going to have more than several thousand products, and if you will do with a couple of store views. 2) Also, you can lease a dedicated server. This option means that your server will not be shared with anyone else. You can choose an operating system and hardware so that they meet your needs. A dedicated server is also good for performance and security. This is an expensive option but it is better for growing business than a shared one. 3) Cloud hosting means that resources for your website are taken from extensive underlying networks of physical web servers. This is a more flexible option than shared hosting because if you need more capacity it can be scaled. Also, this option is more reliable, because your website is stored on several servers. In case any of them breaks your website keeps running..
We hope a fuller image of your future Magento 2 store is beginning to emerge now and if you have questions about anything we’re always glad to help. How to manage Magento 2 CMS pages in the admin panel? Magento 2.3 released: what's new? Magento 2 Features Overview. What's New for Online Merchants?